CHARLESTON, S.C./RALEIGH, N.C. (Reuters) - Thousands of people in the Georgetown, South Carolina, area were urged to evacuate their homes on Tuesday as rainwater unleashed by Hurricane Florence surged down rivers, threatening to submerge some neighborhoods under 10 feet of water. "We are urging people to take this event seriously. We expect the flooding to be worse than Hurricane Matthew a couple years ago," said Randy Akers, deputy public information officer for Georgetown County. "We always urge people to prepare for the worst and hope for the best." "We do have some concerns that people are not taking this event as seriously as they should," he said. In neighboring Conway County, the Waccamaw, which was already well above flood stage on Tuesday, could inundate a coal ash pond that holds more than 200,000 tons of toxic ash, according to Santee Cooper, South Carolina's state-owned electric and water utility. Santee Cooper said it removed more than 1 million tons of ash from the site in the past few years. 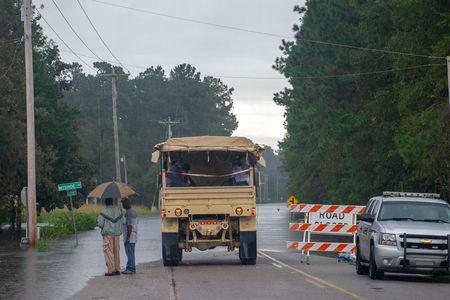 The potential flood zone encompasses some 3,500 homes in Georgetown, 37 miles (60 km) south of Myrtle Beach, and the coastal resort community of Pawleys Island where as many as 8,000 people live, Georgetown County spokeswoman Jackie Broach-Akers said. Authorities were warning residents in harm's way with recorded telephone messages and home visits. The county opened two emergency shelters on Monday, and hotels in nearby Myrtle Beach were offering discounts to evacuees. Public schools were closed until further notice.